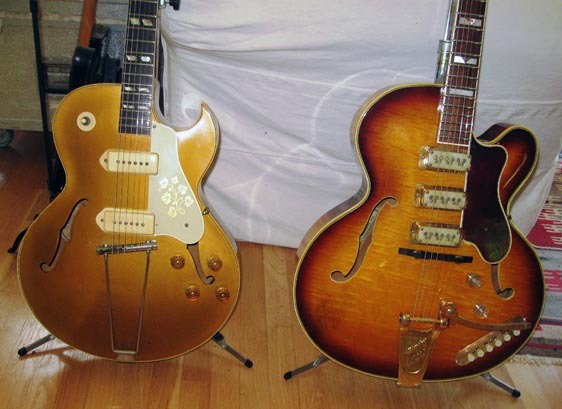 There’s nothing like being able to make some great “finds” when it comes to vintage guitars. I have been doing this since around 1966, and show no signs of letting up. One thing that certainly amazes me is how so many things that you’d think were totally gone, continue to “turn up”, even in some of the most unlikely places! Of course, also with economic times the way they are today, more and more cool and rare items are resurfacing everywhere, since folks simply need the money! The truth is that of course, makers such as Gibson are building their new guitars with as much quality and even more consistency than guitars were built with back in the older days, but there still is just “something” about the patina and age and overall “mojo” that the old guitars seem to have! It’s still “hit or miss” though, as you can certainly old guitars that are “duds”; most likely instruments that were not very good even back on the day when they first left the factory. Another very critical thing to look for with the older guitars is just how much restoration and repair work has been done on them. This can be usually detectable, even though the vintage boom has created many luthiers who can do very intricate and subtle repairs that are virtually un-detectable. These are the kinds of repairs you want to look for; fret jobs that end up looking original, replaced binding that matches the color and patina of the older, original binding, neck resets that are straight and that have no obvious “funkiness” to them, finish touchups that are perfectly “blended” into the older paint or finish, and on and on. I do love the fact that many of the older guitars sometimes represent “one offs” that were either “special order”, ”prototypes” or simply experiments that the manufacturer simply wanted to try. After all, back in those pre-Beatle days, not that many people played guitar, and instruments were not needed at the incredibly alarming rate they are purchased now! These 2 instruments pictured here represent some rare birds indeed, and instruments I have always loved. The Gibson ES-295 really needs no introduction as one of the coolest 1950s pieces ever, and a true Rockabilly “classic”. The Epiphone is a Zephur Regent Deluxe (as maxxed out as can be!) with not only all-gold parts, but with 3 DeArmond pickups and a Bigsby! I really believe this guitar to be a “one-of-a-kind” that was either a custom-ordered piece back in 1962, or was an experiment by Epiphone to see what their classic 3-pickup model would sound like with these great, twangy pickups! Whatever their motives, they certainly hit a home run with this one, and it was one lucky guitar player who made this one his or hers 50 years ago! The Epi must also be the hugest thing I have ever held in my arms….the lower bout must be even wider than a Super 400, and it literally dwarfs the ES 295 that is next to it! So, as I said before, always be on the lookout for these rare birds, and at the same time, pay close attention to the great new guitars that are being created. They offer great value, even greater consistency than the oldies, are are readily available. I believe we are in a “Renaissance” of sorts with the new guitars today, and they certainly will become some of the classics of the future! Caring for Your Acoustic Guitar! The International Spirit of Music! Your Pick and Fingernails are Your Best Amplifier! Handling Auditions Going Vintage, Going New! Another Incredible Night of Music! The Art of "Sitting In" The "Allure" of the Road Catch the Greats Before They're Gone! Don't Let Your Guitar Hold You Back!